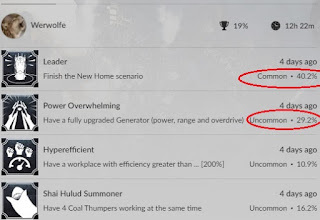 You really have a way with words"
Spoilers: Frostpunk ... is both frosty and punky. 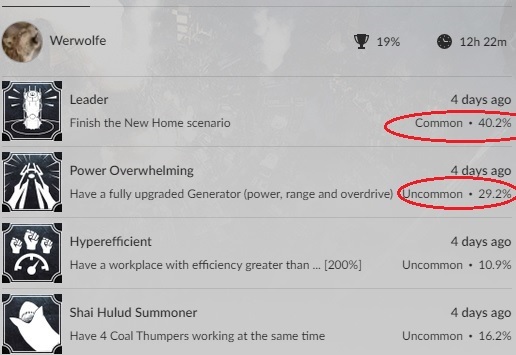 I hate game achievements (nobody should be telling me how to play) but I have occasionally glanced at such lists. Call it morbid curiousity, seeing how others choose to judge and pigeonhole me. Good Old Games is almost as guilty on this account as Steam, shoving the achievements list in your face every time you fire up a game through its distribution program. My most recent acquisition is a post-apocalyptic frozen wasteland base building game. Longer story to follow. Short version: if you're a fan of Tyranny or golden oldies like Alpha Centauri filled with harsh decisions, you owe it to yourself to try Frostpunk. Keep your citizens warm, fed and generally alive in a Cocytus in all but name... by any means necessary. I'm well aware these usage statistics may mislead. I've always found it unlikely that so few people who buy a game will actually play it to the end. Only 40%, really? And that's twice the proportion of some others like RPGs. Still, when discussing two closely related feats within the same game I can safely say I'm comparing apples to apples. Only 3/4 of the people who finished the scenario did so by doing the thing by which you finish the scenario. While a fully upgraded main generator is not the only way to heat homes, it does cover a wider radius than its smaller counterparts, and seemed an obvious choice to me even on a first attempt to fully heat hundreds upon hundreds of citizens' houses. At first I started wondering how everyone else had managed to cover all that ground. After all, the game's not all that difficult once you learn to juggle its options, and I could think of several. Steam hubs? Hot rations through the religious tree? Endless automatons performing all labor? Sure, any of those might work. Then it dawned on me that maybe not everyone was obsessing over saving every last possible remnant of humanity, like myself. An area with radius length one is much easier to thaw out than radius length four, and you can probably still get credit for finishing the scenario with even just one survivor or one household. The suburbs? Corpsecicles. So... yeah... in a game which already has you leading a desperate last bastion of humanity with an iron fist, in a story already centered on making a hellhole even more hellish, you assholes managed to somehow make things even worse by adding neglect to deprivation, drudgery and oppression. So it goes.